Introducing a law to ensure discarded electrical and electronic items are recycled and reused is a good way to protect the environment, said electronics companies and stakeholders. "Without legislation, many parties do not have the drive to do it, said Ms Lynn Loh, Hewlett-Packard's head of sustainability for the Asia-Pacific and Japan. She was responding to Singapore's dismal e-waste recycling rate. The findings of a survey by the National Environment Agency, released yesterday, show that Singapore homes produce 30,000 tonnes of e-waste but just 6 per cent is sent for recycling. She acknowledged that companies may find it costly to implement an e-waste recycling programme. But they can turn a profit when they can extract value from old electronic gadgets during recycling, she said, adding that her company refurbishes products whenever possible. Consumers too need to play their part. Even with e-waste recycling infrastructure in place, a "partnership" is needed among all stakeholders, she said. Ms Lee Bee Wah, who chairs the Government Parliamentary Committee for the Environment and Water Resources, however, believes Singapore can "get closer" to the e-waste recycling rates of other countries. Sweden's rate is 52 per cent while Denmark's is 43 per cent. But achieving it would hinge on Singaporeans being mindful of the impact of their e-waste on the environment, given that many people upgrade their electronic products regularly. While legislation could coax more people into disposing of electronic products properly, it may hurt the business for the informal sector of scrap traders and rag-and-bone men, said Mr Gary Steele, group chief operating officer of recycling facility TES-AMM. These karung guni men depend on collecting electronic gadgets for the bulk of their earnings, said Mr Koh Eng Khoon, chairman of the Association for the Recycling of Second Hand Goods at the former Sungei Road flea market. On a good day, karung guni men can make $30, he said. "We don't earn a lot, so electronic goods are the most worthwhile for us to collect and sell. It is definitely a concern if we lose this avenue for our earnings." • How to recycle e-waste: Smaller e-waste such as laptops, printers, mobile phones and microwaves can be deposited at 400 e-waste bins located at schools, community clubs and shopping malls provided by StarHub's Renew programme. There is now no structured collection and disposal system for bulky e-waste such as refrigerators and air-conditioners. 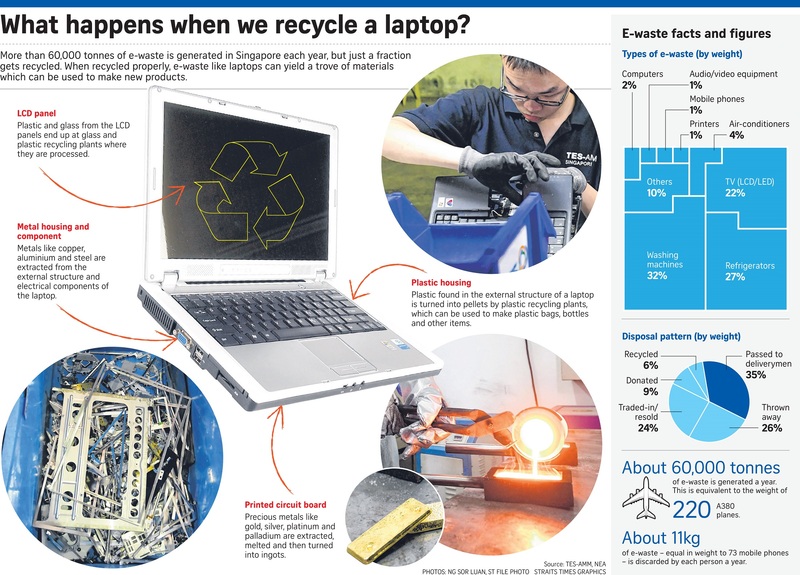 What happens when we recycle a laptop?